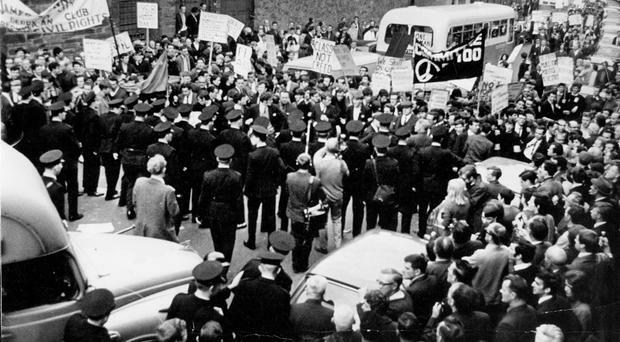 Civil rights marchers are confronted by a strong force of police in Duke Street, Derry on October 5 1968. Sinn Fein are planning to hold a march in Derry on the 50th anniversary of a historic civil rights protest in the city. The party has lodged an application with the Parades Commission to hold a march in Derry on Saturday October 6, 50 years on from the historic October 5 1968 march considered by many to be the official start of the Troubles. The 1968 march was a key moment in the civil rights movement in Northern Ireland and was followed by two days of unrest in Derry. The protest, organised by Derry Housing Action Committee and supported by the Northern Ireland Civil Rights Association (NICRA), was held in the city to highlight the lack of housing, jobs and electoral fairness. Banned by the Stormont government at the time, the parade route was blocked by the RUC. The RUC used heavy-handed tactics including water canons and batons against protesters to break up the march. Footage was captured by television crews attending the protest and beamed around the world, drawing attention to the situation in Northern Ireland. The 2018 march, organised by the Sinn Fein Commemoration Committee will start in Duke Street, the same as the original protest and follow the route of the 1968 parade before ending up at Guildhall Square via the Craigavon Bridge, Carlisle Road, Ferryquay Street, the Diamond and Shipquay Street. The march will start at 3:30pm and finish at 5pm. Sinn Fein has informed the Parades Commission around 5,000 people are expected to attend the event. In February former MP Bernadette McAliskey branded Sinn Fein MLA Declan Kearney "delusional" after he claimed republicans inspired the civil rights campaign. Sinn Fein's national chairperson Declan Kearney said that decisions made by the IRA and Sinn Fein leadership helped form the civil rights movement 50 years ago. But Mrs McAliskey, a civil rights veteran, hit out at the South Antrim MLA's comments, saying he was guilty of "silly rambling". The SDLP were contacted by The Belfast Telegraph but declined to comment on the Sinn Fein event. Police have said they are treating a major gorse fire in the Mourne Mountains as suspicious. The chairman of dissident republican group Saoradh has called on the New IRA to apologise for the murder of Lyra McKee.